…I’ll let you know in a minute. First instinct: Mrs. Bryne’s Dictionary of Unusual, Obscure and Preposterous Words, an amusing volume that catalyzed my interest in weird words and built on the habit that another Mrs. B. established in me. Mrs. Bertheau, my 8th grade teacher insisted that every student’s book report contain five words new to us, along with five minty fresh sentences of our own making. I am a dogged dictionary diver when it comes to definitions, but the practice of using the unusual words I’ve found in a sentence? Not so much. What would friends think if I included Mrs. Bryne’s word zumbooruk––a small cannon fired from the back of a camel––in casual conversation? Unless I turn to writing fiction, that “Z” word is not likely to enter my working vocabulary and zumbooruk is too long for Scrabble. However, those of us who love words can excuse their lack of utility and be satisfied with the swish of pleasure that accompanies the sound of consonants and vowels in crazy combinations. Which is why I’m delaying B for Bryne until J-day: J for Josefa, Mrs. Bryne’s first name. My wife suggested B for Beelzebub because it was the wildest, most esoteric B word she could think of. So that’s it: end the ellipsis above with Beelzebub. In the New Testament “Baal-zebul” is a synonym for Satan or the Devil, and only referenced once, in Luke 11:15. Jesus, when accused, denies that he is casting out demons by the power of Beelzebub. Jesus’ actions were in opposition to Satan and meant to launch God’s Kingdom. Beelzebub pops up in other literature: in Milton as an image representing fallen angels and in Langman’s Piers Plowman: “A bastarde y-bore Of Belsabubbes kynne.” Ancient lingo, but unflattering for sure. Mrs. Byrne doesn’t reference Beelzebub, nor does he appear in any of our other word books. He’s nowhere to be seen or heard in The Word Detective, The Word Museum or I Always Look up the Word “E-gre-gious”. This is the last time I’m likely to use Beelzebub in a sentence, but thanks, Amory. I have enjoyed the consonants and vowels, the crazy stories and references to He Who Shall Not Be Named Again. 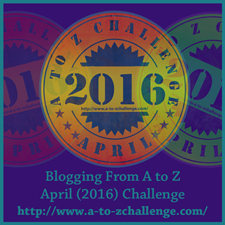 Oh, I’m really enjoying this A-Z blogfest. You’re making this logophile’s day! Loving your words, Linda Lambert! I particularly enjoyed the reference above to Lord of the Flies. I wonder if William Golding had that in mind when he titled his book? I wonder whether Golding had that in mind too. Might be able to research it…but, um, not now.